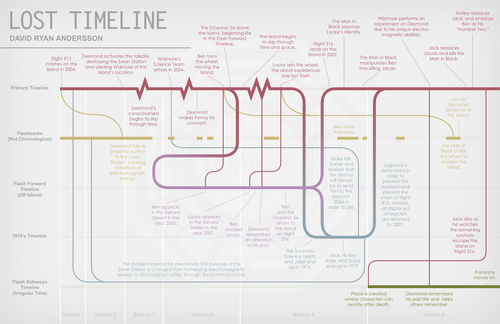 Lost Timeline Infographic. Infographic of the entire Lost Timeline. The timelines are organized the same way they are on the show, all playing out concurrently. I'm more interested in mapping the show's storytelling techniques than presenting a linear cause-and-effect.. HD Wallpaper and background images in the Lost club tagged: lost timeline infographic full series time travel map.